Mary Ellen Sokalski, MAS, speaks on retail-to-promotional products trends during her education session at Expo East. What happens at retail doesn’t stay at retail—and that’s great news for buyers looking for retail-inspired logoed apparel to promote and reinforce their brands. 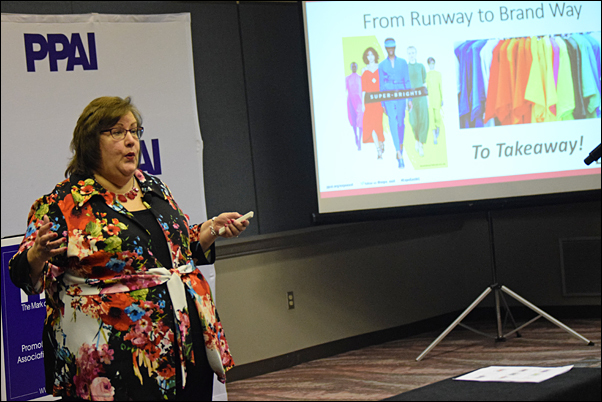 At one of the education sessions held today during Expo East in Atlantic City, industry marketing expert Mary Ellen Sokalski, MAS, presented an interactive look at 27 of the newest apparel and apparel decorating trends that are filtering from retail into the promotional products marketplace, and how to use them to increase sales opportunities. Athleisure is continuing to gain ground with consumers because well-constructed athletic wear, including yoga pants, can go from the office to an after-work social hour without anyone batting an eye. She cited qualities such as low-maintenance, versatility and the fact that many of the fabrics used in these items are odor- and wrinkle-resistant. In a basically flat apparel industry that grew only two percent in 2015, according to data shared by Sokalski, the rise in activewear sales caused a 16-percent spike, and the market is predicted to double in 12 years. “Super-bright” is another apparel trend she revealed, citing the movement toward deeply saturated hues from yolk-yellow and magenta to royal blue now seen in many categories of apparel from tees to light jackets. “In tough times, such as the current political climate, people wear brighter colors to positively influence their mood,” she explained. Another style turning heads is what Sokalski referred to as “street chic” or “utilitarianism”—apparel pieces rife with functional pockets and bonus features to easily store and use tech devices. It’s a trend, she said, that has strong appeal for people of all ages, especially those with active lifestyles, urban dwellers and those who frequent clubs and resorts. In today’s busy world, the trend toward minimalistic/monochromatic apparel is one way wearers are keeping their lifestyles simple. Sokalski noted that these fashion pieces are styled to easily coordinate and their muted color choices emphasize the stress-free appeal. On the flipside, a hot trend is stripes. From bold and geometric looks to traditional, this trend is most often embraced by men (think polo shirts) and those with younger, slimmer figures. For those who love the outdoors or want a fresh-air lifestyle, Sokalski noted a rise in outdoor-inspired apparel and camouflage patterns. Also on trend are heathered fabrics (created by overlapping colored and white threads in the fabric construction), a fresh choice for favorite pieces such as zip-front pullovers, polos and caps. She said the textured look gives pieces a high-fashion look and higher perceived value. “Twenty years ago, our industry lagged behind retail by a couple of years, but now it’s barely six months behind,” she said. “And in some cases, the logo world is driving retail.” One example is with retro looks. Old school graphics, vintage washes and tie-dye inspired prints have made a comeback that’s fresh to many of today’s audiences, and it’s not surprising that this trend has found a following with clubs, schools, teams, resorts and other groups. Denim fashions have been around for more than 50 years, but soft and lightweight denim shirts and jackets, a trend in retail, are getting a strong reception in the promotional products market, said Sokalski. citing their comfort and classic, casual appeal. “Always include a soft denim shirt in a corporate store program,” she advised. Another trend is checkered apparel. “It makes you look approachable,” she explained. Not only is it a look that’s hot at retail, she said, but most checks are subtle enough to work with most logos, and the look is fashion-forward.